Yesterday was the Zoology Department's Annual Bake-off. It's a fundraiser run by the social club every year and attracts quite a list of bakers. I'm not sure how long it's been going for as I've only been a post-grad since last year, but my impression is that it's usually a free-for-all. 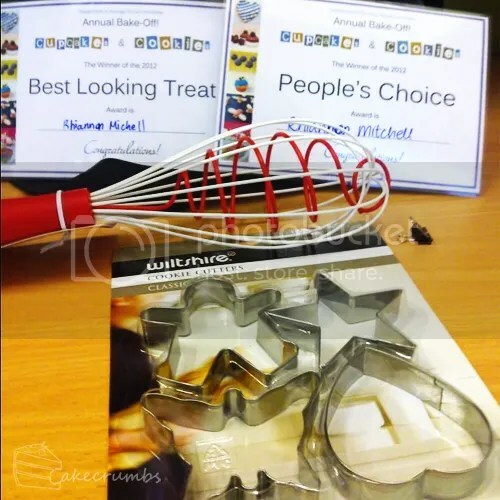 Last year I made the Dragon's Lair Cake for it and walked away with both Judge's and People's Choice awards. But this year the theme was limited to cupcakes and cookies. It took me ages to think of something different to make. Eventually I came up with this idea for the bees, and everything fell into place from there. 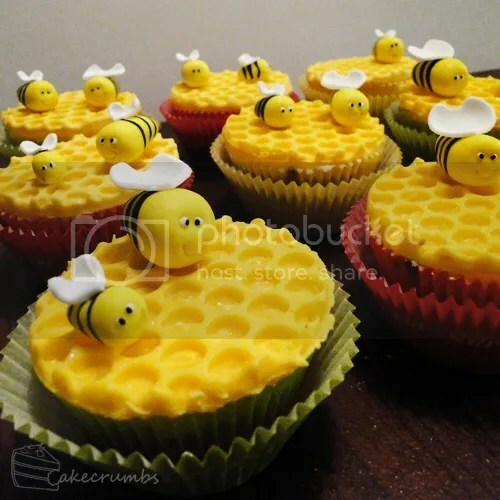 My first idea was of honeycomb-topped cupcakes with little bees buzzing around them. 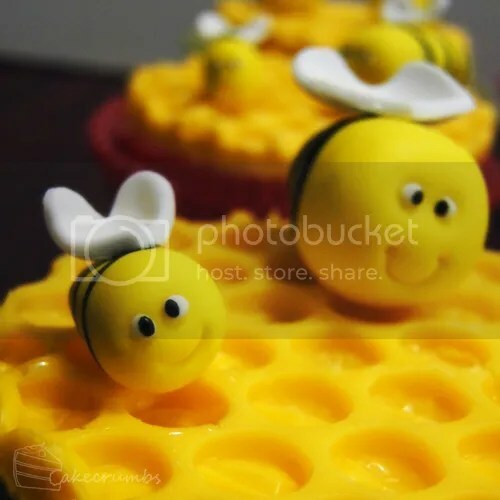 I was initially going to make the toppers hexagon-shaped and have them all join up to form a large hive, but in the end decided circular toppers were cuter. I'd wanted tulip-shaped patty pans, but the store I go to that usually stocks them were all out. So I got these cute patty pans that say "cupcake" on the side instead. I almost didn't want to bake in them and wreck them. 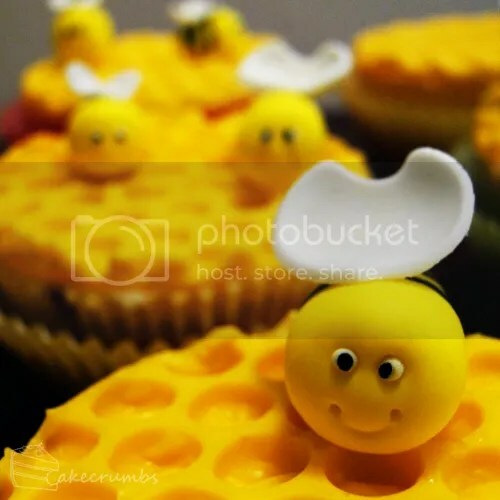 The toppers are made from white-chocolate, tinted with yellow powder colouring. 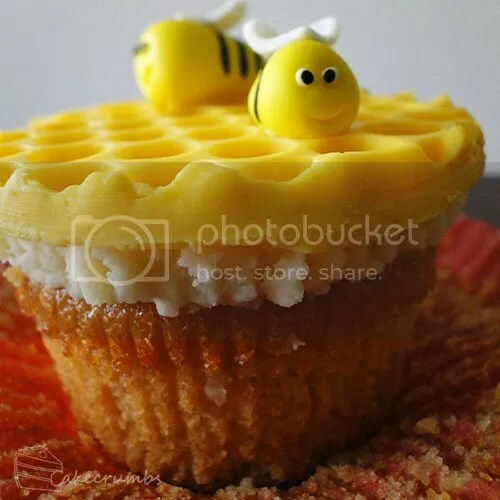 The bees are made from fondant. I've had a few goes at making the bees in the past, but I think I've finally got it down pat. Each time I've tried something new, but this is the best I think they have looked. I painted the stripes on this time and as I had a few days to prepare, I made sure I gave the fondant plenty of drying time before moving to the next step. This helped solve so many of the problems I've had in the past. 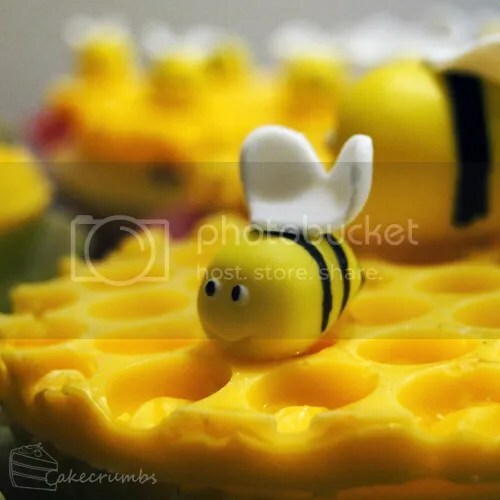 I attached the bees with edible glue I made from piping gel, almond essence and water, which had the unintended effect of making it look like honey inside the honeycombs. I made a dozen in all, but it turned out that they were too tall for all of my cupcake carriers. I had to use other containers, so a couple got left behind. 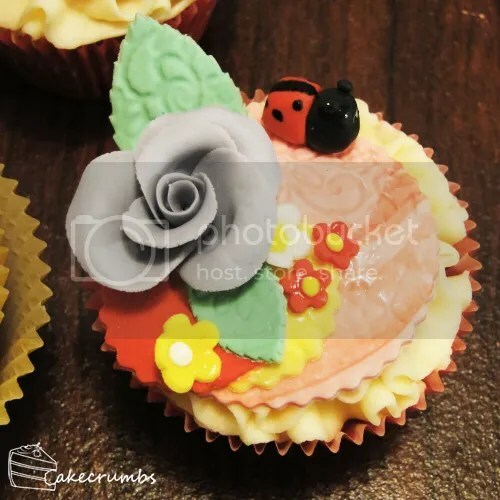 I had thoughts about making the second half of the cupcakes florally with bees perched atop, but in the end decided to accompany them with lady birds. 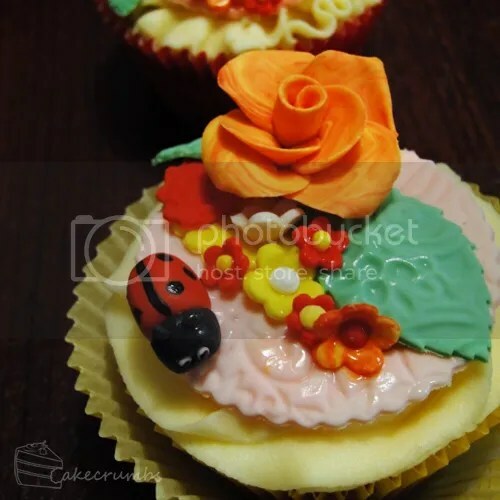 It also gave me a chance to practise some fondant roses, something I haven't tried since the very first time I gave fondant a go. Those early fondant disasters taught me some very important lessons about what not to do with fondant. It's only in the last few months that I feel I've finally learned to control it properly, so attempting something I've been too shy to try was really therapeutic. 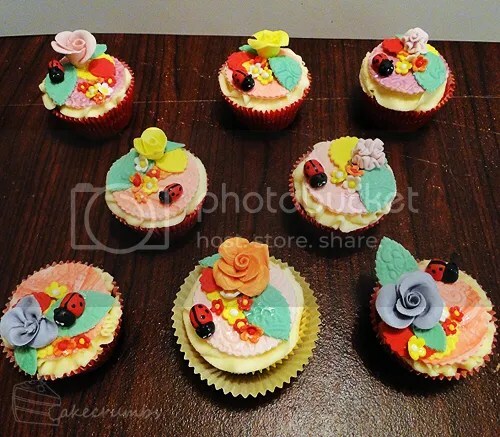 I embossed the toppers and the leaves and gave them some blossoms. I also gave the lady bugs antennae for the first time. I think I prefer them without. I finished these at 2am and after a few hours sleep was off to Uni with them, so when I got home I snapped a few dissected versions of the spares. 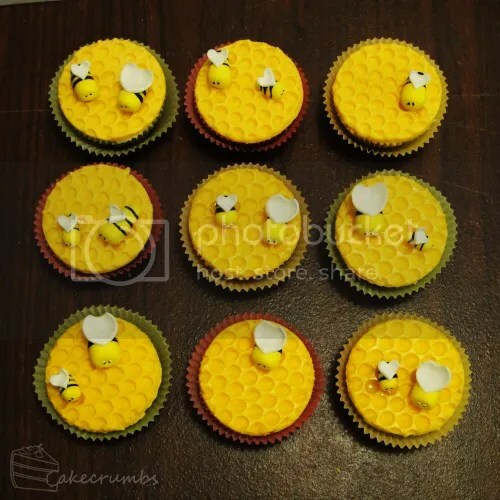 These were honey flavoured cupcakes, topped with vanilla buttercream and then finally the chocolate discs and fondant bees. Straight out of the oven, this recipe is delicious. The sort you want to eat warm with a dollop of butter. After they've cooled, I felt they lost some of that magic. These cakes were cherry and choc chip coconut cupcakes, topped with a swirl of vanilla buttercream and fondant decorations. Of course, having choc chips these ones were going to be also better straight out of the oven, what with the melty centres of goodness. But they were still really nice and packed with flavour later. 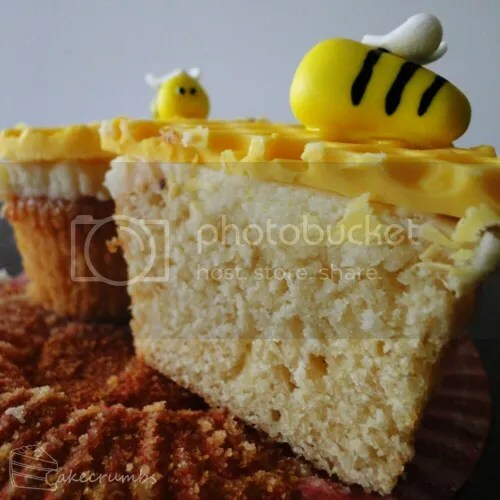 The whole time I was baking, decorating, making fondant flowers while watching the football on TV and yelling at it, and photographing the end results, I had a little fluff ball staring really intently at the bees. He wanted to nom some. How about the bake-off itself? It was lots of fun with another awesome turn out and an impressive array of baked goods. I wish I had photos for you, but I was far too shy to take any. There were lots of yummy-looking cupcakes and elaborately decorated cookies. Some of the cookies were crocodile and koala shaped, flooded with royal icing and decorated with things like coffee beans or sprinkles for the features. There were giant cake pops decorated with fondant roses (and non-edible glitter – eeek! ), so there's definitely a few seasoned decorators around the department. Somehow I still got the Judges Choice and the Peoples Award. Somehow the certificate giver misspelled my name. The Judges gave best-tasting to the chocolate and peanut butter cupcakes, and the croc and koala cookies received the "OMG" Award — the later being a renamed version of the "OMGWTF" Award that was supposed to go to the most deliciously ugly entrant, but nothing was considered ugly enough. Last but not least, here are the recipes if you want to make the cupcakes yourself! Combine buttermilk, honey and vanilla in a small bowl and mix until combined. Cream butter and sugar until light and fluffy; add eggs one at a time, beating well after each addition. Gradually add the wet and dry ingredients alternatively, stirring after each addition. 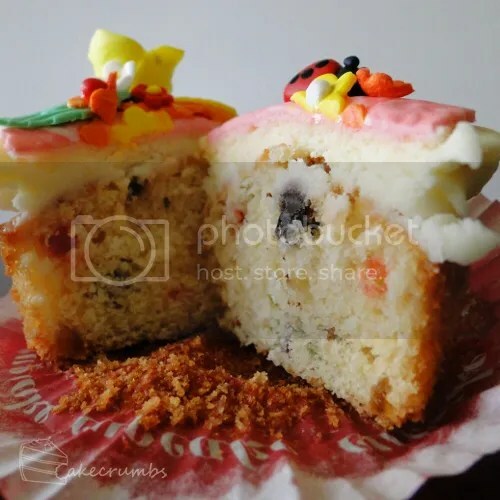 Spoon into cupcake liners and bake for 20-25 minutes. Cool in pan for 5 minutes, then place on a wire rack to cool. Stir in milk, coconut, cherries and choc chips. Stir in flours. Those Cherry and Chocolate Chip Coconut cupcakes sound delicious! The detail on these is amazing. I love the bright colours, great shapes and the embossing. The overall theme was well thought out. Thanks so much. 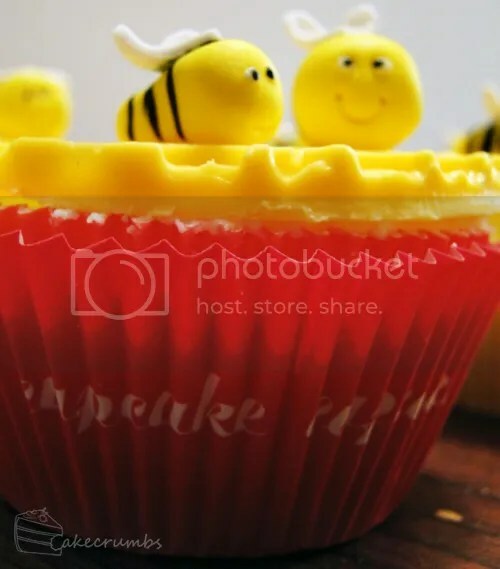 I’m usually pretty picky about the fondant figures and usually hate something about them, but with the bees I was actually so thrilled with how they came out I couldn’t eat them, either. 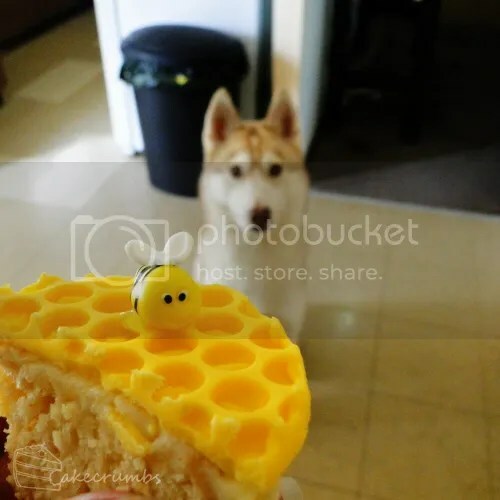 I gave that bee to my puppy simply cause I couldn’t bring myself to eat it! Also, I just realised I forgot to reply to your message! I read it in between the baking madness of the weekend and said I’d come back to reply but didn’t. Sorry, that was so rude of me. But I just wanted to say first thanks for all the info, and second that the Mother’s Day platters you did looked fantastic! 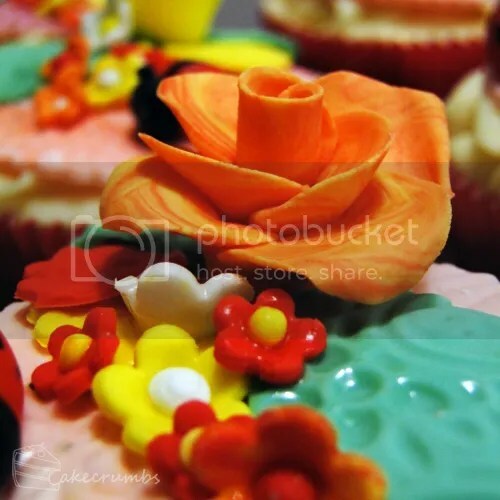 I especially love the piping in the cupcakes – they look so neat! And lastly that you’re correct in that Cake Deco is the one on Flinders. Neat little shop. It’s about half the size of the cake decorating shop I sometimes go to in Greensborough, but has about 10 times the stock! So you spend the whole time tip toeing around trying not to knock the store over. It’s ok! I remembered you saying something about homework so I figured you were busy. The platters actually sold really well… the only one left was the one with the bouquet on it because my idiot manager piled too many others on top and squished the lid into the icing. 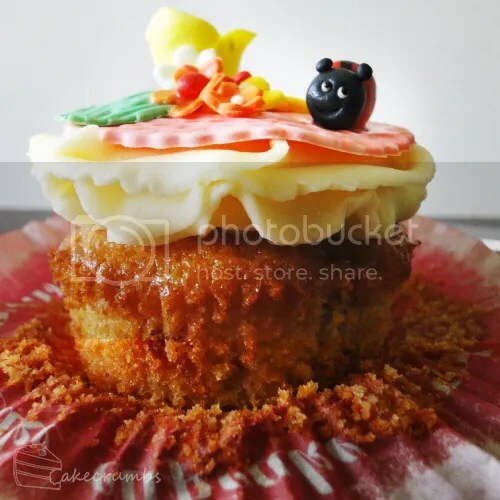 And I actually found the very icing tip they use at work for those cupcakes at House last Saturday 😀 the trick is to do it slowly and carefully and all in one motion. Oh what tip do they use? I think I might know the one you mean – it’s sort of a beige-ey colour. I assume it’s like the Wilton 1M tip, but bigger? I’ve been meaning to get some of those. That is exciting! I’d love to do a course like that, it would be so much fun. I felt like it was something I should really do considering how woeful my knowledge of that stuff is, and because my wrist may never fully heal (I did something to it at work back in January and I’m currently waiting for permission from work’s insurance company to go get an MRI done) I really should start learning something new. They start off with all the basic kitchen skills to begin with and then move on to cakes, pastries, petit fours, etc. One day I’m going to have to try to fit in a short course somewhere. It would be nice to learn from a pro sometime. 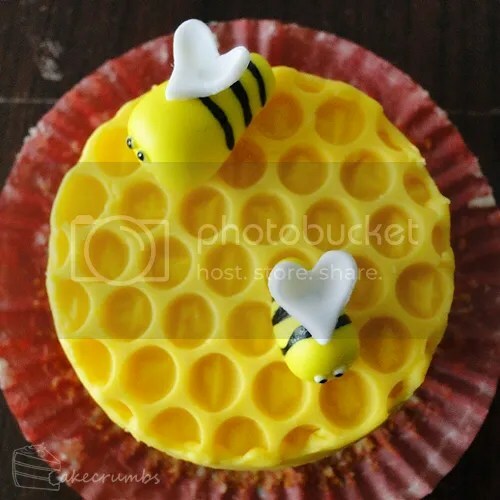 Love the honeycomb toppers! The fact that they’re made of chocolate instead of fondant makes them even better! Your roses are incredibly pretty as well! Also, I love that the bees’ wings are actually heart shaped. SO adorable. Haha, for a moment there I was worried I’d have to use fondant instead cause I had hell getting the chocolate circular! It’s nice being able to top the cupcake with something most people love to eat. Thank you for stopping by, and thank you for such a lovely comment! 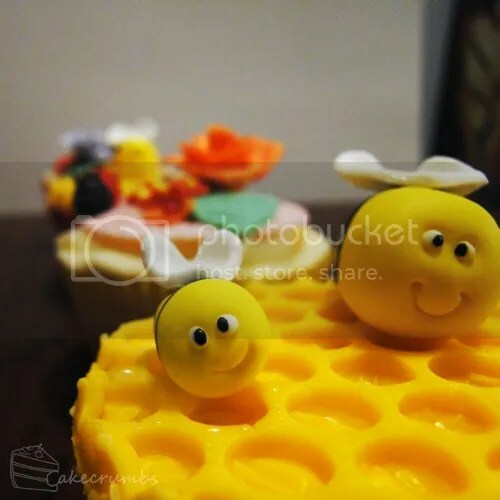 Hi I wondered how you made those toppers and what item you may have used. LOVE your stuff!! !